The Rev. Rick Warren, a conservative evangelical pastor, has been tapped to deliver the invocation at President-elect Barack Obama’s inauguration – and gay rights advocates are not happy about it. WASHINGTON — Famed pastor and best-selling author Rick Warren Wednesday defended his invitation to Democratic Sen. Barack Obama to speak at his church from objections by other evangelicals to the senator’s support of abortion rights. Obama is one of nearly 60 speakers scheduled to address the second annual Global Summit on AIDS and the Church beginning Thursday at Warren’s Saddleback Church in Lake Forest, Calif. So two years ago we have pro-lifers “outraged” over Obama’s invitation to an AIDS summit, and now we have gay rights advocates “outraged” over Warren’s invitation to an inaugural event. Our country needs to move forward. I don’t care what you think about gay rights, abortion rights, any of it: we need your voice. We need everyone to work together on making actual progress instead of this self-destructive fight to silence people who disagree with us on this issue or that issue. Democracies function best when everyone puts their word in. And I honestly don’t give a crap if the guy working with me to stop AIDS is pro-choice or anti-gay. If we continue to shut ourselves off from each other, we will make no progress on anything. Today 50,000 people packed the Oval at CSU to see Barack Obama speak. The line was two and a half miles long, and the rally got an early start, so the Secret Service stopped screening people in order to get everyone in as quickly as possible. My friends and I got a spot about two thirds back on the length of the oval. Because the crowd was so long, it was pretty hard to see, so we ended up taking turns pushing up on each others’ shoulders to get a quick glimpse. My camera has a swiveling screen, so I could get it above some heads and see a bit, periscope-style. But most of all, it was great just to be there. Obama mostly went through his current stump speech, emphasizing his plans to make taxes lower than they were under Ronald Reagan, reform healthcare, restore the economy, and improve access to education. Because of our location farther back on the oval, I couldn’t get the greatest photos, but I managed to take a few decent ones… Check them out on my Picasa album. 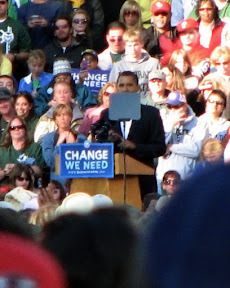 I also took a quick video of Obama speaking on the economy, as well as one of the crowd of 50,000. This is just me talking, but I found this conversation much more informative than the entire debate which kept on throwing Joe’s name around for political fodder and support. I wasn’t proud of either candidate’s performances in the three debates, but stuff like this deserves a lot more attention. Negative ads and smears that don’t show the whole picture are escaping the actual issues, which nobody seems to be talking about these days. I wish I could see more stuff like this from both Obama and McCain – we’d be making much more informed decisions if they could just change their approach. Not only is this plan risky, but it’s extremely expensive. For comparison, the “liberal,” Democrat-written economic stimulus act passed earlier this year totals $256 billion – $904 per American. (This includes spending over the next 10 years, not just the tax rebate check this year.) The Bush bill would give up to $2293 directly to irresponsible businesses on behalf of every single American. Conservatives, please take note! The current financial crisis must be dealt with quickly – if we take no action, we will be in a horribly worse situation. But we have to make sure that we take the right action; there are no second chances at this. The rationale for any government intervention is that preventing the failure of these huge companies is not in the public interest. Indeed, if some of these huge companies were to fail, it would have a devastating impact across America. By contrast, the Bush bailout is simply a $700 billion check to the companies that are reaping the consequences of their irresponsibly risky actions. The federal government must take actions that are truly in the public interest. This means not only keeping these huge companies from failing, but making sure that they cannot continue to take advantage of middle class Americans who are already struggling. Regulations must be put in place to ensure that taxpayers’ investment in these companies actually will benefit them. The Barack Obama campaign has started a petition online for an economic recovery plan that actually works for Americans. This issue is clearly not a matter of left versus right. Americans need to come together and demand accountability and responsibility from big business and Washington as they plan our economic future. I encourage you to go sign it – this isn’t about Barack Obama or John McCain, or left versus right. It’s about protecting all Americans. We are facing a financial crisis as profound as any we have faced since the Great Depression. Congress and the President are currently debating a bailout of our financial institutions with a price tag of $700 billion in taxpayer dollars. We cannot underestimate our responsibility in taking such an enormous step. No Golden Parachutes — Taxpayer dollars should not be used to reward the irresponsible Wall Street executives who helmed this disaster. Main Street, Not Just Wall Street — Any bailout plan must include a payback strategy for taxpayers who are footing the bill and aid to innocent homeowners who are facing foreclosure. Bipartisan Oversight — The staggering amount of taxpayer money involved demands a bipartisan board to ensure accountability and oversight. This site is a great tool, check it out… Put in your basic tax information (nothing personal) and it calculates your tax cut under Barack Obama’s tax proposal – and how much more you will pay under McCain’s plan. This is an important factor for conservatives to consider- the Republican party of the last eight years has abandoned the ideals of fiscal conservativism in pursuit of other priorities, such as their aggressive foreign policy agenda and expansions of executive privelege in an ever-more-powerful federal government. While the GOP once served the interests of responsible spending and limited government, this is no longer the case. I make no claims that Barack Obama is himself a conservative- he is most certainly liberal in his views. However, his plans and policies (warning: PDF link) reach above partisan politics and should serve to benefit all Americans, not just liberals. Conservatives no longer have a party or candidate that truly stands for them, but I believe that Barack Obama’s tax cuts and other plans deserve a lot more attention from the displaced conservative demographic.